Jetstorm is the library to make Pharo communicate with the Lego Mindstorm Ev3. We provide the technical report. It explains the protocol and the architecture of the library. With the evolution of JetStorm, the Technical Report will be improved. Posted in JetStorm, News, TechNotes. I begin to write a strong interesting new functionality in Phratch: the Meta Repository. The idea comes from Pharo: The Meta Repository is an area where you can put the installation process (in our words, a Metacello Configuration) of an extension of Phratch. You can build a Metacello configuration based on the chapter already written about Metacello, available here: http://pharobooks.gforge.inria.fr/PharoByExampleTwo-Eng/latest/Metacello.pdf. For now, you just need to have a class that has the pattern name ConfigurationOgYourAddOnName, where YourAddOnName should be changed by the name you want. Finally, on the user side of Phratch, you can see a new menu “AddOns”, where you can install all new add-ons. For now, there is one project: JetStorm for Phratch, that allows one to connect the robots Lego Mindstorms to Phratch. I hope a lot of new projects will appear in following months. a color, which is the color of the blocks inside the category. For now, the category has not necessarily the same color because the display of a category is based on an image in the scrachSkin subdirectory. This point is not explained here. We will use a basic color for the category. an order number, which represents the place of your category in the display screen. a viewer page, which represents how the category is displayed when we click on it. Most of the categories have the basic behavior (displaying blocks), but sometimes, we can need specific ones. For example,the category “Variables” has some buttons (Make a variable, Make a list and Make a block). Here we will use the basic viewer page. So, let’s go for creating our own category. where the color can have others values. This label will be used to place your future block in this category and is used for the display. which gives the place where the category will be placed. Your first category is done. Congratulation ! Your empty category is available in the Phratch environment. A last thing about category: when a category is created, a new setting appears in the Setting browser. This setting allows to show or hide the category in Phratch. By default, the value is true. In Phratch a block is a message sent to a Sprite. By default the Sprite “Sprite1” is a PhratchSpriteMorph. If you need to have a specific behavior, just create a subclass of it. 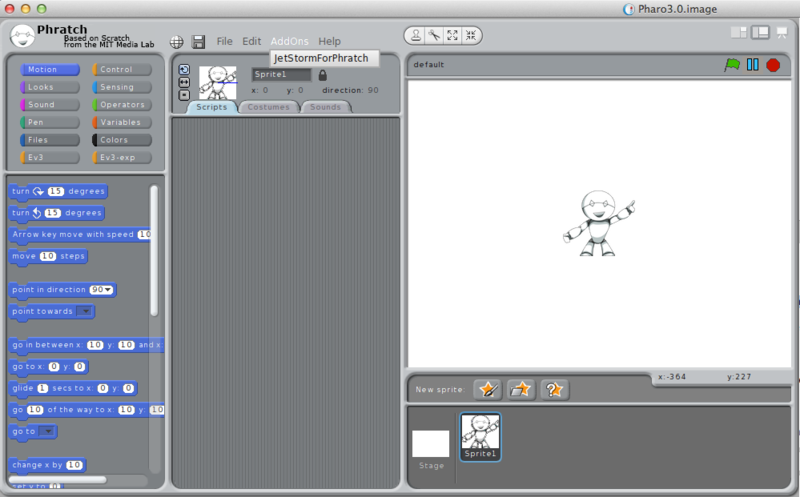 Then, you will have the possibility to select this new specific sprite when creating a new sprite in Phratch. In this tutorial, we do not create a new sprite. We will use the generic one. In PhratchSpriteMorph, create a protocol “*MyOwnBlocks”, to be clean with the modularity of the system. When updating the view in Phratch, by clicking on “My category” a new block appears. By clicking on this block a transcript appears. You have written your first block ! phratchItem contains the label of the block. It contains also the entry for parameters. kind is the kind of block. By default “#-“ means that the block is a CommandBlockMorph. defaultValues is an array with the default parameter if your block needs them. subCategory is a symbol that allows you to order blocks inside your category. special is an array with special behavior that should be executed on the block before the block execution (the main use is the parametrization of the block itself). Here, you can see that a parameter is present in phratchItem: this parameter is a String. So, we have a block that open a browser on a class that you can parametrize. The default value is ‘Collection’. You can change it by an existing class. In Phratch environment, click on this new block, you will see a browser on Collection. All types are declared in the class PhratchType. Each type is declared with the pragma <phratchType: #’’>. You can browse these methods to see existing types. A block can have multiple forms. In our examples, we manipulated the CommandBlockMorph. It exists multiple ones. You can see them as subclasses of BlockMorph. The main ones are CommandBlockMorph that executes a command, ReporterBlockMorph that returns a value, BooleanBlockMorph that returns a boolean. I stopped this tutorial here. It is enough to write simple blocks in Phratch. You can discover kinds of block or types by right-clicking on an existing block of the system, then ‘show block’ in the menu. You will see the method and particularly the associated pragma. Dear smalltalkers, phratchers and everybody interested to help Phratch development. We need you as an international community. Phratch needs your help to be multilingual. The most of work is already done, It is based on the Scratch work (Thank you for all the supported languages). Now, as Phratch has a lot of new features, we need to translate each of these new features. For each of the following languages (ar, bg, ca, cs, da, de, el, es, et, eu, fa, fi, fr_CA, gl, he, hr, ht, hu, id, is, it, ja_hira, ja, kn, ko, lt, mk, mn, mr, ms, ne, nl, no, pl, pt_br, pt, ro, ru, rw, sk, sl, sv, th, tr, uk, vi, zh_cn, zh_tw), we need to complete the lines available in the phratch issue tracker (https://code.google.com/p/phratch/issues/detail?id=120). You can post your work as a comment or send me a mail, I will then integrate it in Phratch. There is less than 130 small expressions. It is 1 or 2 hours of work, and it helps us a lot. Do you know Lego MindStorms ? The last one is the Ev3 serie (http://www.lego.com/fr-fr/mindstorms/). One particularity of this version compared to the previous ones is the possibility to plug a Wifi key and connect via TCP. So, if you have this material (one Mindstorms Ev3, one compatible Wifi key), you can control your robot with Pharo ! I know also that for Christmas, it is not possible to learn a new API, we all have a lot of other things to do ! So, you can play with it into Phratch. For that, just load Phratch and the package EV3Phratch as follow. I continue to develop Phratch, the port of Scratch in Pharo. Phratch is a visual programming language on top of Pharo. possibility to customize the environment: add new categories, add new kinds of Sprite, add new blocks. ((Smalltalk at: #ConfigurationOfPhratch) project version: '1.0') load. (Smalltalk at: #PhratchFrameMorph) open perform: #saveImageForEndUserSilently. I hope to write documentations about all of the new features asap. 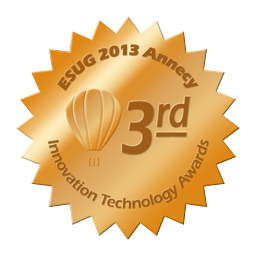 Thanks to ESUG and all the participants of ESUG 2013 at Annecy. Phratch won the 3rd place of the “Innovation Technology Awards”. At the ESUG 2013 conference, we presented the current status of the RoboShop project. Santiago did a great job and now we are able to run tests of our scenario of a helper robot in a shopping mall. Based on a map built using laser SLAM, the robot computes the shortest path to fetch items listed by a customer in a shopping list. The slides below include a video of the first tests. They also give a bird’s eye view of the architecture, where we use Pharo for orchestration. We also reuse existing software from the ROS community through our client PhaROS. Posted in News, Pharo, PhaROS, Project, RoboShop.